These are about as sundried as we're going to get.....leaving them out to dry in the real sun would result in no tomatoes for us, and a whole lot of tomatoes for Charly. I planted 16 tomato plants this year thinking I would have this huge abundance of tomatoes to can. 3) I have zero counter space to save those that have already ripened. So I started doing this. A batch or two a week. And then I'll freeze them for winter to add to pastas, sauces, and salads when I'm refusing to by those orange crunchy things they call tomatoes in the stores. 2. Slice. Not too thin. 3. 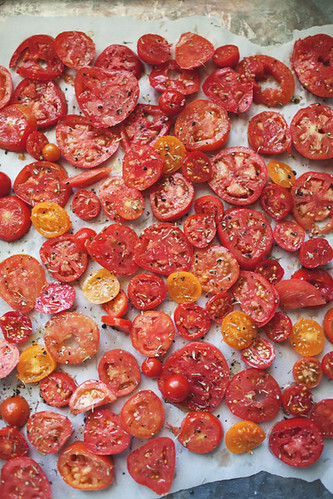 Spread them out on a lined cookie sheet and drizzle with olive oil, a little thyme (or whatever you like), and s&p. 4. Put them in your oven at 150-200° for 5-6 hours, depending on how you sliced them. I never said they were the prettiest things, but boy are they good, and come winter they'll be like gold! How lovely is this!! I only planted three tomato plants this year and had a hard time keeping up with them...love this idea! Great idea! I bet they're so good! Talk about a serendipitous moment for me! 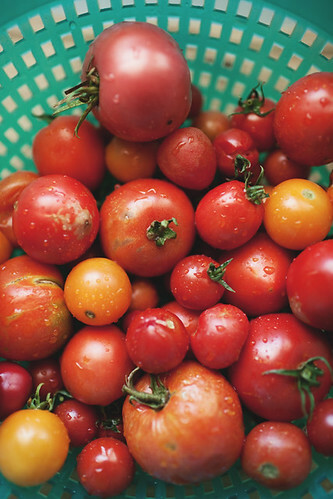 I just happened to stumble across your blog while blog-hopping and just happened to have a box of 25 pounds of tomatoes in my garage waiting for me, starting to rot, what a shame! I canned a ton of salsa last weekend but am all canned out. And, frankly, can't really manage to can by myself at home with a four month old, kinda need the husband's help for that one. This idea totally saved me! My oven's been going since yesterday morning. Thank you thank you! I tried this today, and on 150 for only 90 minutes mine were burned to a charred mess. I obviously did something wrong. Maybe not cut them thick enough? The few that were salvaged tasted SO YUMMY. I will try again this week. I love your blog! yum. I am making these this year with the fazillion green tomatoes I will have ripening in bags on my counter if we get a frost next week like we are supposed to. Stupid winter. Swooping in and stealing the fun. My garden is PACKED with produce that needs 2 more weeks of heat. First time commenter over here! 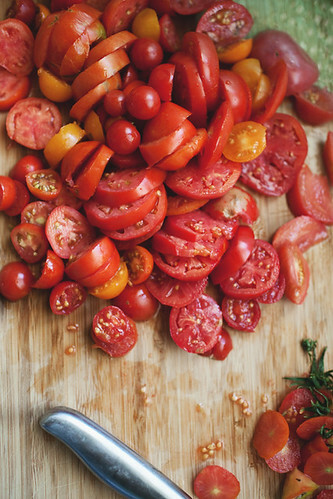 I am trying these tomatoes this afternoon. And then going for the vegetarian lasagna with pine nuts you posted. Fast becoming a huge fan of your blog corner. :) Spells home and I like that. A lot. Then what do you do with them?? Put them in oil olive?? I'm wondering how to store them. Noticed others were also. but could not find the answer. Maybe I just over looked it? Unfinished recipe as usual . Do we guess on how 2 store them & what kind of tomato do we use ? Are those cherry or full size ? Give sum details !! I used to cut my tomatoes in half and make my sun- dried tomatoes in the oven but they usually come out slightly burnt with the thinner ones stuck to my pan. 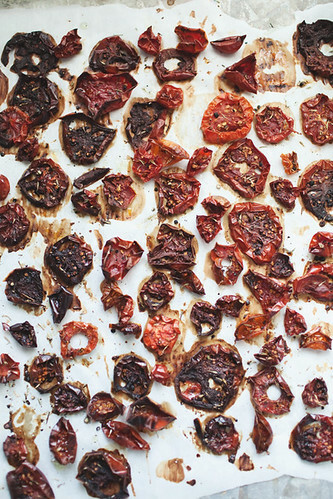 Since I purchased a food dehydrator, after drying the tomatoes a bit in the oven until they no longer drip, I transfer them to the dehydrator until they are dry enough. No more oven burns and they don't stick. They always turn out perfectly. I then keep them in mason jars submerged in extra-virgin olive oil which I love drizzling over pasta, bread and just about any dish I like.